On an evening in December 2000, Marisol Pérez recalled gathering in prayer for the resolution of a case the School of Law’s Immigration and Human Rights Clinic had filed on behalf of factory workers from Matamoros, Mexico. Pérez (J.D. ’00), then a law student in the Immigration and Human Rights Clinic course, joined with fellow law students, professors, community leaders and maquiladora workers outside the San Fernando Cathedral. There they held the prayer service in advance of a hearing with the National Administrative Office, an administrative body which heard workers’ complaints arising from the North American Free Trade Agreement, or NAFTA. During the hearing, workers testified to unsafe working conditions and serious health concerns at auto supply factories in Mexico. Pérez said these legal complaints paved the way for reform in the maquiladora industry. The experience was one of many that bolstered Pérez on the path to becoming an immigration attorney. Growing up in San Angelo, she said her father was one of the first Spanish-speaking lawyers in the area and he had a family law practice in which her whole family took part. “He instilled (in me) the whole notion of lawyering at a very young age, how service was fundamental,” Pérez said. 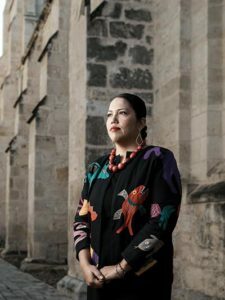 “It’s a very holistic approach to lawyering and that’s a real gift that we receive as law students,” said Pérez, who recalled sometimes driving her clinic clients to court because they did not have access to a vehicle, and being taught by experts and scholars, such as Clinical Professor of Law Lee J. Terán. Many of the attributes she learned through the clinic are qualities she’s carried with her into her career, previously working as an immigrants’ rights attorney handling litigation and legislative matters for nine states with the Southwest Regional Office of the Mexican American Legal Defense and Educational Fund, or MALDEF, and now as a partner at De Mott, McChesney, Curtright & Armendáriz LLP in San Antonio.